This spring and summer, ALRFS staff will be planning and implementing small stand management treatments to mitigate forest fire and safety risks posed by dead trees on UNBC Campus. 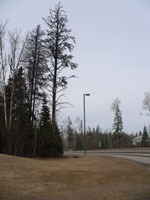 Planned and supervised by Mike Jull, professional forester and manager of the ALRF, these treatments will focus on a total of around 5 hectares of beetle-killed pine stands plus any scattered unsafe trees along campus road sides and parking lots. A consultation process for the UNBC campus will be conducted through the last half of April and the tree removal will occur in June and July. More information about these campus forest management activities will be available on the UNBC Facilities website.